David Koepp’s adrenalin filled action film Premium Rush is an entertaining look at the subculture of bike messengers in New York City. Featuring Joseph Gordon-Levitt as Wilee an energetic and evasive bike messenger who has to deliver a promissory note within 90 minute across downtown Manhattan. Michael Shannon plays the corrupt NYC cop Bobby Monday with a penchant for gambling in Chinatown and is hell bent on getting that promissory note as an exchange for $50 000 to pay off some gambling debts. 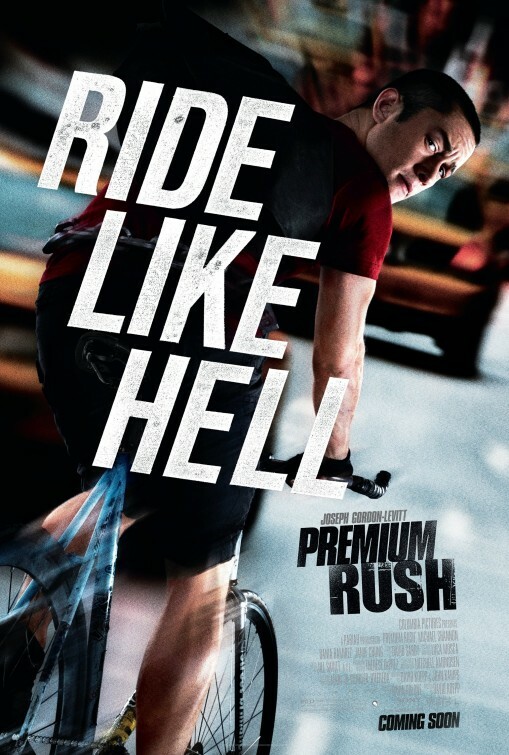 Premium Rush signified by the racy poster is a hazardous and wonderfully executed cinematic joyride especially with Koepp’s creative directorial style often using time frame lapses and GPs co-ordinates so that the viewer can get a sense of the dangerous navigation involved in riding as a bike messenger in the Big Apple, the ultimate urban jungle. Joseph Gordon-Levitt normally cast in supporting roles in big budget movies like Inception and The Dark Knight Rises, has the talent to hold his own as leading man in an action film and is fast becoming a rising star. Gordon-Levitt will next be seen opposite Bruce Willis in Looper. In Premium Rush Gordon-Levitt’s cheeky, energetic and daring bike messenger with no brakes Wilee is played to the hilt and with some great editing incorporating all the elements of this dangerous and little known profession in one of the world’s busiest cities. This is a different take on a chase movie as it is about high speed urban cycling and all cyclists should definitely see this film not just for the entertainment value but also for all the cycling skills highlighted in this film which is like a Tour de Manhattan with an angry Michael Shannon helplessly chasing after Levitt who constantly evades him as well as much frustrated NYC bike cop.Dania Ramirez plays Wilee’s love interest, Vanessa, a fellow bike messenger with brakes. There is not much plot and limited backstory, but Koepp keeps the film firmly in the Manhattan urban jungle highlighting a low-paid, dangerous street profession which is a culture in itself, the adrenalin energetic time driven world of metropolitan bicycle messengers. Shannon who brings some of his unpredictability to Premium Rush channelling his characters in the series Boardwalk Empire and in Revolutionary Road in which he garnered an Oscar nomination for best supporting actor. Premium Rush with all the directorial quirks, fast editing and catchy dialogue is a great way to spend 91 minutes viewing life and death on a bicycle, showing off all the street culture of NYC in mid-summer featuring two highly talented upcoming actors, Gordon-Levitt and Shannon playing a cat and mouse game with a Chinese twist.